What takes a hundred years to make? 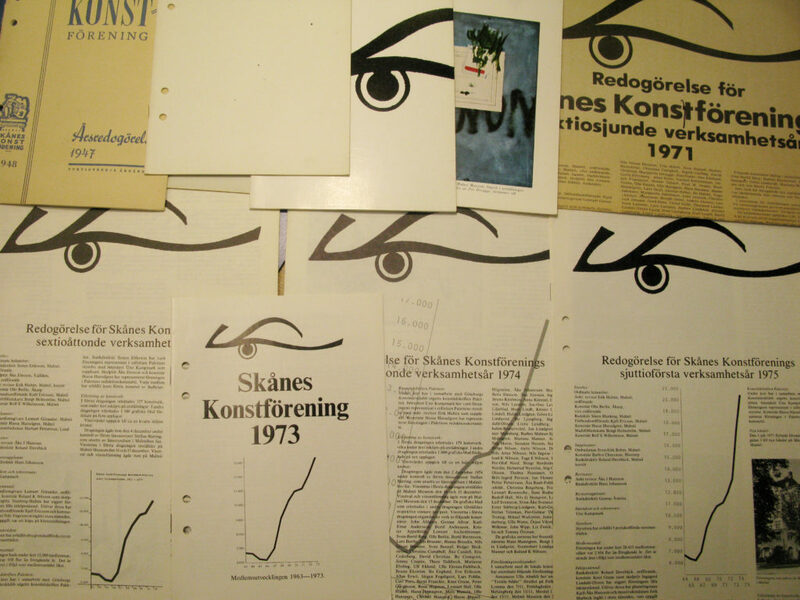 is a reflection on the history and archival material of Skånes konstförening, from within and in the context of its re-invention, looking at the institution itself, its history, its possible futures. As we ponder on the long time span of the existence of Skånes Art Association (founded in 1904), the over one hundred years of art making, we intersect it with history itself, unfolding, even if sometimes from a distance, and accompanying the transformations of the city of Malmö. The exhibition comprises paintings “inherited” by the association, which have rested for a long while on shelves, in dark underground storage spaces, selected documents from the archive, random found material suggestive of various historical moments, alongside artistic interventions and video works inviting us to think about urban planning, utopian dreams, personal experiences intersecting the institutional. It also includes interviews with former key figures from Skånes konstförening’s recent history, debates regarding the changing visions and missions of art organizations over the years, and archival films to reflect upon the history of cities and to act as reminders of the political transformations happening today – when the “city of workers” is becoming more and more a “city of borders”, the right to strike is put under question and art structures often dispassionately use the language of contemporary distress in order to drop in and out with minimalist gaze from the lives and contexts they otherwise ignore. What takes a hundred years to make? began from a recurrent statement at Skånes konstförening: “We have more than one hundred years of history behind us”. And from noticing that we did not know the contents of that history – since the team and the board working now are relatively new to this inherited history which lends itself both to factuality and to imagination. The result, this first exhibition and series of events, is as fragmented as memory can be, putting together emotions and suppositions, pieces of history or names that caught our eyes from an endless sea of names (those of members, board directors, artists, events, places, advertisements), information fictionalized by the different levels of understanding Swedish (from almost zero to native) and by the different gazes of the persons who have visited the archives so far. Time unfolding onto space and protruding from every weathered thin archival document, grave recurrent questions reminiscent of war and the safety of nations, personal dreams and ambitions crushed or fulfilled by the Autumn Salons and endless lotteries; we fuse together all these grand and classical ideas with the destiny and timelines of local art institutions and add onto them important questions which need to form and inform the future: how can one fight against the ephemeral existence and preserve the fleeting memory of self-organized art structures, how can art institutions actively undo their own colonial stance and become true reflections of the big local words – of “diversity”, of “inclusion” – also becoming spaces of care, to the point where the existent structures within them need to be severely transformed in order to make space for the others claiming space. This exhibition and all its statements, side events and walkthroughs are the result of many conversations. The initiative and curatorial work behind the exhibition was made by Simona Dumitriu. Besides the input from the persons currently working at Skånes konstförening (Sebastian Dahlqvist, Louise Waite), we need to thank the following for the time spent and the flow of ideas: Ana María Bermeo Ujueta , Laura Hatfield, Jari Malta, Janneke Schoene, Kah Bee Chow, Helena Olsson, Jenny Grönvall, Elena Tzotzi, Carl Lindh, Livia Pancu, Ramona Dima, Marte Edvarda Tidslevold.